For those who decide to keep an exotic species as a pet, it can be a challenge to find a veterinarian to care for a unique pet. Whether you have a rabbit, ferret, gecko, or parrot, not all veterinarians are trained or equipped to diagnose and treat these kinds of animals. Depending on what kind of species you have, finding a vet to work with may be a real challenge. 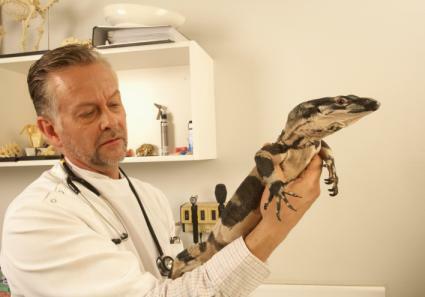 While finding a doctor to care for your exotic pet may be challenging, it's not impossible. One of the best ways to find a vet that will treat exotic animals is through word-of-mouth. Your fellow exotic pet enthusiasts are likely to know and use someone and may be able to make a recommendation. However, if you don't have anyone to ask, there are a few other resources you can try. One of the best places to start when searching for a vet for your exotic pet is your regular local veterinarian. Many private practices employ vets who specialize in exotic pets. If you already have an established relationship with a practice, call the office and ask if the doctors there will see your exotic pet. At some larger veterinary hospitals, you may find a greater variety of experience with the doctors when it comes to exotic species. Several national and international associations exist for vets who have a particular interest in a certain class of animals. These groups do not require anything more than a membership fee for the vet to join, but if you search for a veterinarian listed through one of these organizations, you will likely find someone who has taken the time and money to learn extra skills and medicine to treat that species. In addition to these species-specific veterinarian associations, you can also search the American Board of Veterinary Practitioners by specialty and the local area. You may also check with a veterinary school or large institution-style practice (such as Animal Medical Center in New York City). These types of places will usually have an entire department dedicated to exotic species. In order to become a specialist, the veterinarian has to complete two to three years of formal training in that species area through a residency after veterinary school. A research paper, case reports, presentations at meetings, a case log, letters of recommendation, and continuing education attendance may also be required. After all that, the vet has to pass a written and practical exam. Does the office have the right kind of equipment to deal with your species of exotic pet? If you're going to a private practice, how many exotic pets of the same or similar species do they see each year? Is the vet a member of any special associations? If the vet doesn't specialize specifically in your species of pet, what is his experience in dealing with the species? Just as with dogs and cats, most veterinarians will know when specialty care is needed and will refer you to a larger hospital or a specialist if need be. Since fish do not take to travel well, their medical care can be difficult. Most of the advice in these species ends up coming from experienced hobbyists. For large pet fish, particularly koi, some veterinarians have developed a niche area of practice. Koivet.com has a list of veterinarians with a special interest and knowledge in fish medicine. Your nearby aquarium store may also be able to suggest a local vet who can help you with fish. Hopefully your exotic pet will never need complicated veterinary care. However, with a little research, you can find the best vet for whatever species you have at home.